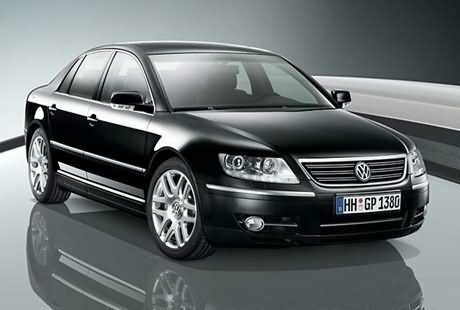 Volkswagen Phaeton 3.6 is one of the beautiful five seater luxury sedans launched in India. The car has stunning exteriors and has already captured attention of many car enthusiasts. The car has been launched keeping in view the high income group car lovers. Appearance: The car is exceptionally beautiful. The exterior consists of fog lamps, body colored door mirrors, front grille, front under spoiler, headlamps and chrome trimmed radiator grille. The alloy wheels give a sleek look to the car. Comfort: Volkswagen Phaeton 3.6 has advanced comfort features for the occupants. The four door car has ultra spacious passenger cabin and luggage box. The car has front seats with electric 12 way adjustment including lumbar support, Front and Rear centre armrests, Fixed Rear Bench Seat, Isofix child seat preparation, Fuel Flap unlocking, Remote boot lid release, Parking Heater and a Powerful A.C with 4 zone climate control. Other comfort features include Hi-tech audio system, leather covered steering wheel and leather upholstery. Safety: Volkswagen Phaeton 3.6 has advanced safety features. The car has Speed Sensitive Power-assisted Steering, Anti-Lock Braking System (ABS), Automatic Distance Control (ADC), Continuous Damping Control (CDC) air suspension and Electronic Stabilization Program (ESP). Other safety features include Safety Belts, Crash Sensor, Front and Rear Seat Side Impact Airbags, Driver and Front Passenger Airbags, Door Side Impact Protection and Curtain Airbag System. Engine: Volkswagen Phaeton 3.6 is equipped with 3.6L, V6 petrol engine and a 6 speed Tiptronic gearbox. The engine can generate a maximum torque of 370Nm at 3500 rpm. Price: The price of Volkswagen Phaeton 3.6 is Rs.76,29,128 (taking New Delhi as base price location). However, the prices specified are indicative prices only and reflect lowest approximate price which excludes tax, registration, insurance and cost of accessories.